In 2006, when Doug Jones ’05 attended the Florida Association of Independent Agents insurance convention, he never imagined he’d meet kindred spirits and future business partners. Six weeks after meeting at the convention, Fernando Alvarez ’04 and Luis Gazitua ’04 joined Jones at his father’s insurance agency in Coral Gables. Five years later, the trio left the agency to start JAG Insurance Group, an innovative insurance provider that operates with customer service and transparency as their differentiator, allowing them to provide out-of-the-box solutions a-typical of the insurance industry. “We were very lucky to have a mentor like my father to navigate the waters of a new business. His knowledge and relationships in the industry were incredibly valuable to us” said Jones. But, the convention was not where the business partners first met. Prior to entering the insurance industry, the men were student-athletes at FIU. Alvarez and Gazitua played baseball. Jones played on the inaugural football team. After graduating from FIU, they went in different directions. Alvarez played for the Chicago White Sox; Gazitua worked in his family business, Sergio’s Cuban Kitchen and Bar; and Jones worked for his father’s insurance firm. When the former athletes partnered to build JAG, they took their athletic prowess from the field to the office, building a company with the mind of an athlete. “Having gone through similar experiences as student-athletes helped us develop a culture where can count on each other,” Gazitua says. Today, JAG has grown to more than 30 employees and has hired several FIU athletes as producers and business development officers. The employees at JAG understand what is it means to have fun, work hard and maintain discipline. Almost a decade after the teammates reconnected at the convention, the business was booming and JAG was growing. However, they felt that there was something missing, and the team began to look for a high-powered Chief Operating Officer that could help make their business more efficient. Rosado, also an FIU graduate, joined Gazitua, Alvarez and Jones in January of 2017, making their leadership team 100 percent FIU alumni. And they all attribute much of their success to their time spent at FIU. 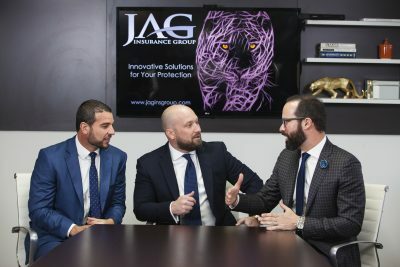 They credit the institution with instilling a constant drive within them, and they continue to see that drive in the graduates working at JAG Insurance today. Knowing that FIU graduates students who are prepared and are some of our community’s top talent, the leadership team at JAG always looked to hire FIU graduates. That was the case for FIU alumnus Juan Lopez. 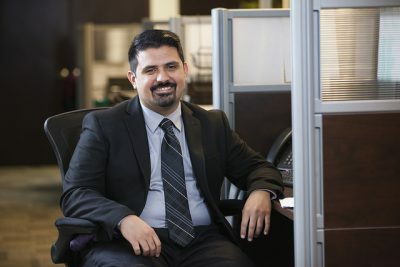 After three years feeling burnt out and underappreciated in the insurance industry, Lopez was looking for new opportunities. When he first arrived at JAG Insurance for his interview, he was hesitant, but as soon as he sat down with Rosado, they instantly began to bond over their alma mater. Everything seemed to click. “My FIU education shaped me into a great communicator, allowing me to identify the best ways to get my message across,” Lopez says. He used this skill to illustrate to Rosado how he would be an asset to JAG Insurance during his interview. After leaving the interview, Lopez was confident, and rightly so. Before he even left the building, Rosado called him and asked him to come back to the office where she offered him the job. With offices more like a startup company rather than the typical insurance agency, Juan was pleasantly surprised when he arrived for his first day at JAG. The company’s open door policy allows for employees to communicate their ideas to management and assist in improving work processes. “We take a lot of pride in creating a work environment where employees feel valued and enjoy what they do,” Jones says. The team is confident in the caliber of education FIU graduates receive and have an expectation for FIU students far beyond other candidates. Now they are working to provide more students from FIU with similar opportunities. “Personally, I’m committed to giving back to the school that gave me a shot,” Alvarez says. 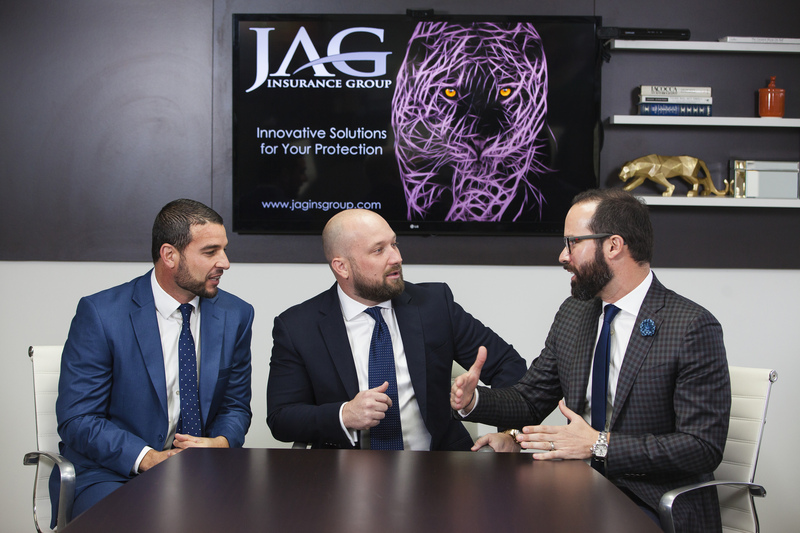 Recently JAG Insurance Group began a new paid internship program that gives junior and senior level FIU students meaningful hands on experience working with one of Miami’s leading insurance firms. Interns have the opportunity to work alongside seasoned executives in helping facilitate a wide variety of client services.